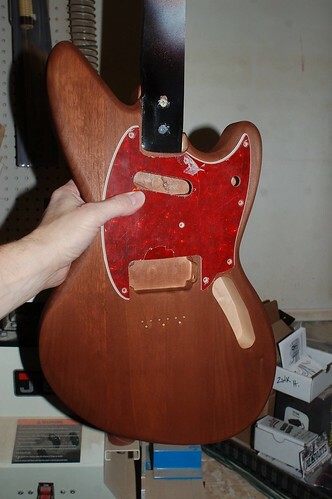 Posted: Thu Oct 08, 2015 3:37 am Post subject: Full Scale Custom Walnut Stained Jag-Stang! 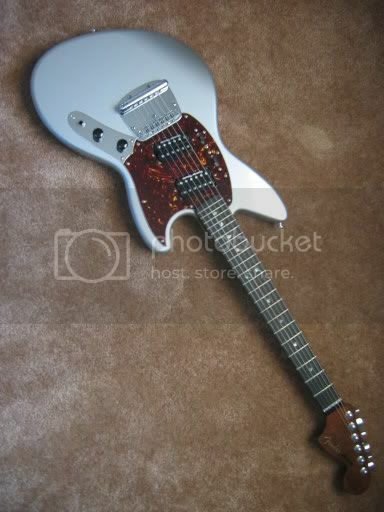 So the the white Jag-Stang I put together with Cooterfinger's help making the body with the design elements I came up with went well. I really enjoy that guitar a ton! ...so much so I wanted to make another one with a little different sound and vibe. It all turned out great.... so I want another one. 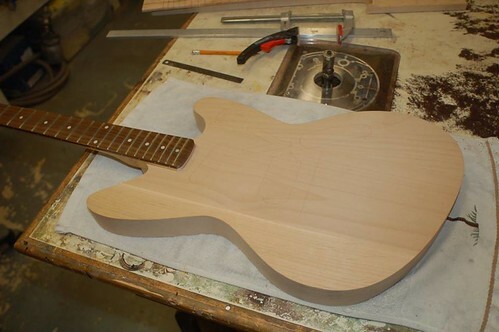 This one I want to have some more Telecaster Plus elements to it. I already had a white Lace Sensor neck pickup from a guitar and a red/red humbucker to go with it. I sold the humbucker because it was black and the neck pickup was white. Used the cash to get a white version to match. 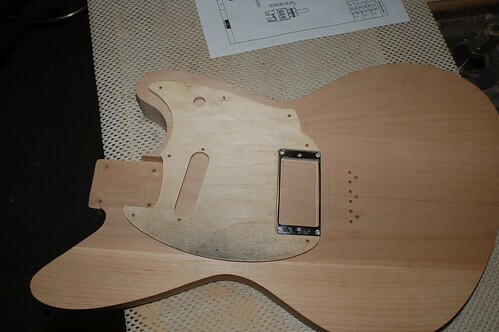 I also took the neck from the Peavey that I had made in to a sort of tele plus for this project. 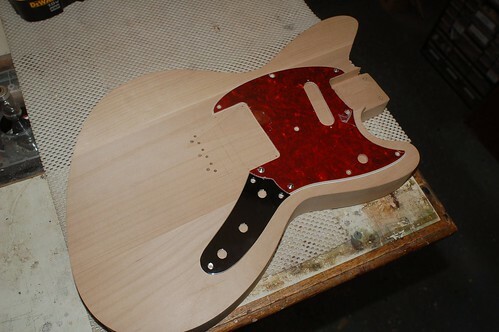 Jag-Stang body with contours and string through bridge. Single neck and pickup ring mounted humbucker like version 1.0 of mine. 500k volume pot and TBX tone pot with push button kill switch. Heavy On/On/On Duo style toggle. 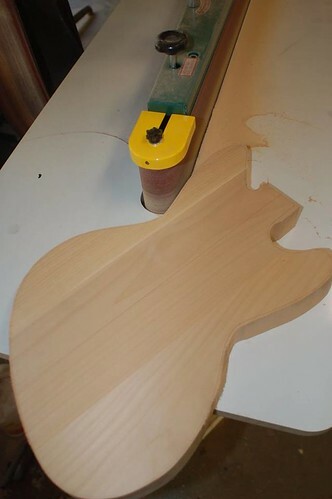 Peavey neck that I will make a new decal for that is more similar to a Telecaster Plus decal. 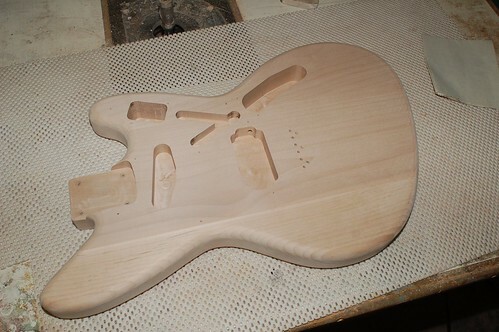 Not sure what brand I will use for it yet since it won't have a Fender headstock shape. 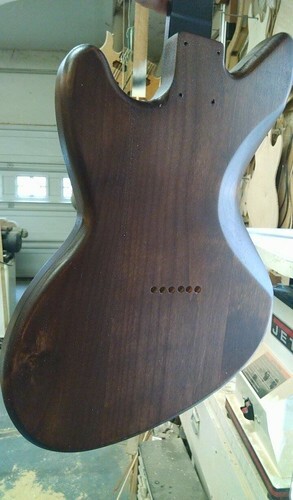 BTW, this is the other one I did that had a Music Master neck on it. I kind of miss this one in many ways.... I think this new version should be even cooler! Decal design. A little Radiohead vibe since it is what got me initially in to the tele plus setup. Who is said new builder? I have things needing paint haha. PST Guitars. (P Scott Tucker.) He is in VA.
How is the paint job? 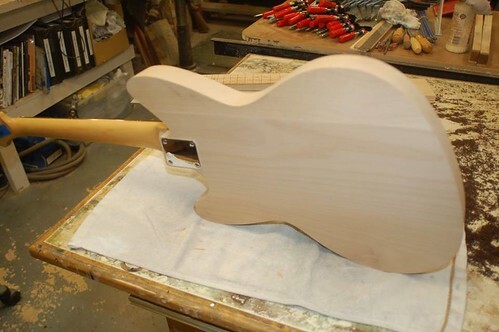 He use polyurethane? Sorry I missed your post Austin, he uses Mohawk piano lacquer. Not sure what kind it is but he says it cures fast. Here is the latest pic. He made the guard template (minus the center guard screw he just added in for me) so it should be set to rout soon. Progress! 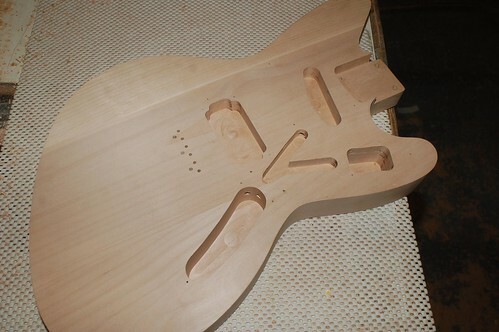 He cut the tortoise pickguard and did the control routs. 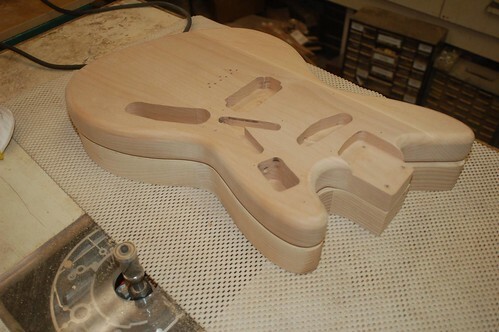 It needs contours before staining. As you can see it has a sibling. New thread for that one coming soon. How many jagstangs do you need? Lol. I would at least change it up more. Dunno. I seemed to have found a shape and setup I really like so now I am trying to use different pickups to get some different sounds. A lace pickup and a JB don't really sound alike to me. I am trying to do different sounding electronics with the same body setup since I like it. 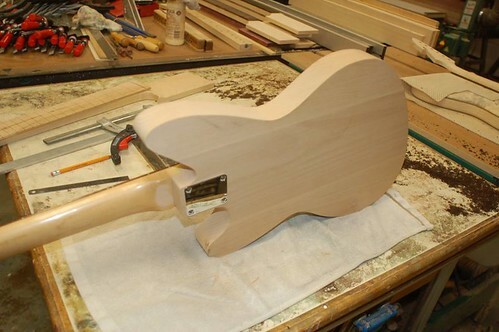 Kind of like the people who mod Jazzy's or Mustangs to make the guitar that is comfortable sound the way they want. Got a progress picture with the brown. I guess it is called Gibson brown or coffee table brown. The flash washed out the grain. It is being sealed now. Hopefully pics with more detail will be done soon. Looks good with the red guard. I need to look that up. Probably right up my alley. That thing was hella heavy. Do you remember the type of wood he used? I want to say mahogany or walnut but I can't remember. looks pretty awesome. 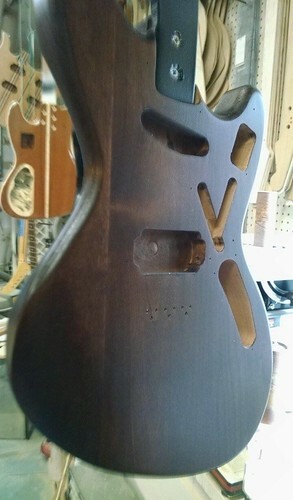 Warmoth body? 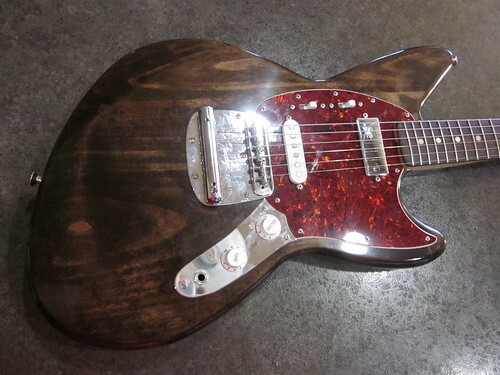 I like the dual slanted humbuckers.